Are you or a family member in need of professional alcohol treatment? Perhaps you are looking for an alcohol rehab in Wales but need some help and guidance with choosing the correct one. Rehab Guide only works with the most reputable alcohol rehabs in Wales and the UK. We specialise in providing bespoke alcohol treatment for those suffering from an alcohol problem or addiction, and we are here to help ensure you receive the correct alcohol treatment that will enable a full recovery. All of our Welsh alcohol rehabs are strictly regulated, CQC registered and staffed by qualified professionals, many of whom have overcome a problem with addiction themselves. They have experience of the destruction and devastation that the disease of alcoholism can bring. They also know that it is possible to live a happy and productive life sober and are living proof of what can be achieved with the help of a professional alcohol rehabilitation programme. Our private alcohol rehabs in Wales have proven track records of successfully treating alcoholism. Staffed by qualified psychiatrists, psychotherapists, doctors, nurses, alcohol addiction counsellors, holistic therapists and alcohol support workers – a multidisciplinary approach is taken that focuses on healing the whole person and not just one singular aspect. This has been clinically proven to be the most effective method of treating alcohol addiction successfully. Rehab Guide offers a highly professional and ethical service that will ensure that you or your loved one are supported throughout the entire alcohol treatment process. Please call and speak to one of our friendly alcohol addiction treatment experts who will gladly advise your of your alcohol treatment options in and around Wales today. Statistics for alcohol consumption in Wales shows that 75% of all alcohol consumed in Wales is drunk by the 22% of the adult population who are hazardous or harmful drinkers. Moderate drinkers consume an average of 211 units of alcohol per year compared to 1,236 for hazardous drinkers and 3,924 for harmful drinkers. Harmful drinkers spend an average £2,882 a year on alcohol compared to £1,209 for hazardous drinkers and £276 for moderate drinkers. The Welsh government are currently looking at addressing their pressing alcohol problem by introducing minimum pricing for alcohol in Wales. “People who drink alcohol at hazardous and harmful levels drink 75% of the alcohol consumed in Wales. The introduction of a minimum unit price would be effective in reducing alcohol consumption among these groups, as well as reducing the number of alcohol-related deaths and hospitalisations. “The report shows the greatest impact of a minimum unit price would be on the most deprived harmful drinkers, while moderate drinkers would experience only small impacts on their alcohol consumption and spending. This is because moderate drinkers tend to buy alcohol which would be subject to little or no increase in price under the policy. It is apparent from Welsh alcohol statistics that harmful levels of alcoholic drinking are most prominent in the poorer and more deprived areas of Wales. Currently, it is reported that 50% of the population in Wales purchases its alcohol for less than 55p per unit and that 37% of Wales buy their alcohol for less than 45p per unit. The heavier drinkers are shown to buy their alcohol below these thresholds. By introducing minimum pricing of alcohol in Wales, it is hoped that this will directly impact on the amount of alcohol consumed by the country’s more deprived areas. Rehab Guide is here to help you or your loved one access the most appropriate alcohol rehab in Wales for your treatment needs. We endeavour to make this process as quick and as easy as possible. We appreciate that most individuals requiring immediate alcohol rehab or treatment will only ask for help in a time of crisis. In the addiction treatment field, we refer to this as a “window of opportunity”. Alcohol addiction is a disease of the brain that often deludes the sufferer. An individual suffering from alcoholism may well think that they are in control of their drinking or that there drinking isn’t that bad. The reality that is apparent to all around them is often very different. Alcoholism affects nearly every area of the suffers life and also heavily impacts on family and loved ones. It is important to understand that an alcoholic is a very sick individual and is suffering from a life-threatening illness. Trying to get an alcoholic to see the complex and destructive nature of their condition can be a very frustrating and heartbreaking process, especially for those that love and care for them. An individual suffering from alcohol addiction will often only ask for alcohol help when they feel they have exhausted all other options and fear for their own life. This often follows an alcoholic crisis of some description such as a drink driving conviction, a loss of a job or a severe deterioration in health. This window of opportunity is likely to remain open for only a short time. This is why is crucial to act promptly while an alcoholic is open to the idea of undergoing alcohol treatment or possibly alcohol rehab – Before they retreat back into their comfortable delusion that they can beat alcoholism on their own. Rehab Guide can ensure that no opportunity to recover from alcoholism is wasted. We will work quickly, efficiently and professionally, taking care of all the necessary arrangements, so you don’t have to worry. As a leading authority on alcohol rehab treatment in Wales and the rest of the UK, we can facilitate immediate admissions to Wales top alcohol rehabs today. Call us to find out more. Finding alcohol treatment in Wales that provides the foundations for long term sobriety can be confusing especially if this is the first time you have had to seek alcohol treatment. Successful alcohol addiction treatment needs to be tailored to the individual as alcoholism can manifest in a number of dysfunctional behaviours – It is not all about the drink. Quitting alcohol is only the very start of a recovery. For some, stopping alcohol can be a challenge in itself, and a medical alcohol detox may be required if there are signs of alcohol dependence. Once free from alcohol, medications, psychological treatments and holistic therapies can then be of maximum benefit. It takes hard work, commitment and change in order to remain sober and avoid alcoholic relapse. Addiction to alcohol needs to be fully addressed through a comprehensive alcohol treatment programme. It is vital that this is tailored to the individual’s specific treatment needs. Failing to address certain aspects of the alcoholic illness can result in relapse, but this is easily avoided with our expert help. When treating alcohol addiction and alcohol abuse, there is no one size fits all. A good alcohol addiction treatment programme in Wales will address medical, physical, social, psychological, emotional, educational and spiritual needs. There are many different types of private alcohol rehab available in Wales and the rest of the UK. Understanding the differences can help you to choose the rehab that is right for you. If you or a loved one are looking for free alcohol rehab in Wales, the sad truth is that free alcohol rehab is very hard to come by. The free alcohol rehabs that do exist in Wales are often dominated by a particular religion or do not offer the evidence-based alcohol treatment needed in order to achieve a full and lasting recovery. If you wish to apply for free alcohol rehab that is CQC registered and offers professional alcohol rehabilitation as well as a full medical alcohol detox, you or your loved one will need to register with your local addiction treatment services. You can easily locate your local drug and alcohol services in Wales by speaking to your GP or by contacting NHS Direct. Local drug and alcohol services can apply for government funding/statutory funding for alcohol rehab on your behalf. Please be aware that this is not a simple or quick process. Privately paying for alcohol rehab is the only guaranteed way you can access immediate rehab treatment without delay. NHS alcohol rehabs in Wales do not actually exist. NHS drug and alcohol rehabs are a very misunderstood concept. What the NHS does provide are community drug and alcohol services which can be accessed by anyone who is registered as living locally in the catchment area. Local NHS drug and alcohol services in Wales generally only offer support and keywork sessions. The options for inpatient alcohol treatment in Wales are private rehab, charity rehab or government-funded alcohol rehab. In exceptional cases an NHS hospital will conduct an inpatient alcohol detox, but only when there is a primary medical cause for admission aside of alcoholism. In order to apply for government funding for alcohol rehab on the NHS, it will be necessary for you or your loved one to register with your local drug and alcohol services. Sadly, for many suffering from alcohol dependence or alcohol addiction, the criteria and waiting list prove too demanding, and they fall victim to an alcoholic death before the desperately needed alcohol treatment is made available. In 2012/2013, NHS Wales Informatics Service recorded 34,000 alcohol-related hospital admissions that year, costing the Welsh NHS £109m annually. In England and Wales in 2016, 63% of all deaths relating to the misuse of alcohol were caused by alcohol-related liver disease. The Office for National Statistics reports that in 2017 there were 13.5 alcohol-specific deaths per 100,000 population in Wales. This is an increase from 12.7 recorded the previous year. 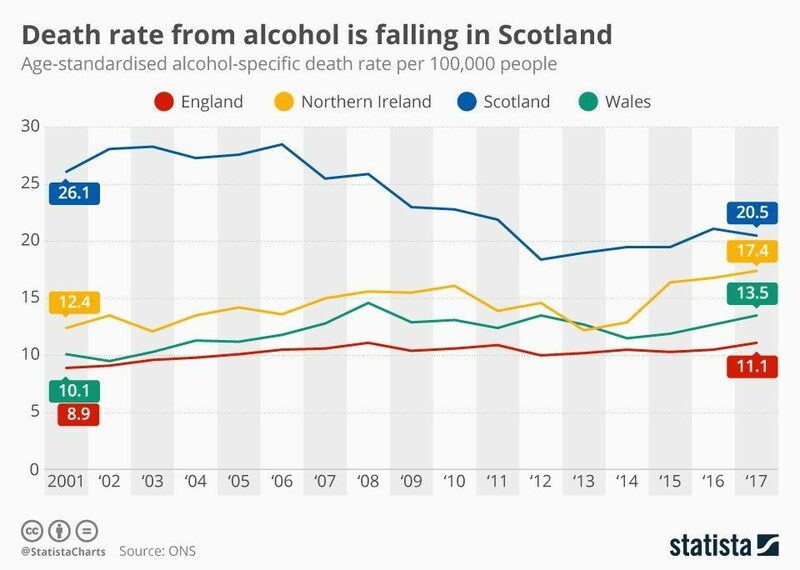 While Scotland’s alcohol-specific death rates are falling, Northern Ireland and Wales are seeing an increase. The cost of private alcohol rehab in Wales varies tremendously depending on where you go and the type of alcohol rehab you choose. Duration of treatment and whether a medical alcohol detox is required can all affect the total cost. Realistically, medical alcohol detoxes need not be expensive, but please proceed with caution and be wary of very cheap alcohol detoxes advertised in Wales. Usually, if they look too good to be true – they are! Any alcohol rehab you attend should be CQC registered and staffed only by qualified medical staff and counsellors. Alcohol addiction is a very complex disease that requires not only medical treatment but also a comprehensive psychological treatment programme consisting of evidence-based addiction treatments. Rehab Guide only works with the most reputable CQC registered alcohol rehabs and detox clinics in Wales and the rest of the UK. You can be assured of receiving quality care and treatment by allowing us to help you choose which rehab is best for your treatment needs. Alcohol detox can be life-threatening if not conducted correctly by medical professionals within a rehab environment. This is why we want to ensure that you or your loved one only undergo treatment at a Welsh alcohol detox clinic that follows the correct alcohol detox protocols and government guidelines to the letter. Private Alcohol Rehab Wales – Why Choose Rehab Guide? Everyone’s idea of the perfect alcohol rehab location is personal to them. For some, it may be the hustle and bustle of city life in a Cardiff alcohol rehab, for others, a secluded countryside holistic rehab with beautiful surroundings and nature walks or perhaps a beach rehab near one of Wales many beautiful beaches and attractive seaside towns. Whether you are looking for a structured rehab day programme or a more holistic and luxurious treatment approach, we will do all we can to ensure that your treatment needs and personal preferences are met in full and kept strictly confidential. If you are looking for private alcohol treatment in Wales, we can assist. Following a free of charge comprehensive alcohol assessment, we will design a bespoke alcohol treatment plan that takes into account your location, budget and specific treatment requirements. We want to ensure that all aspects of your alcohol treatment are covered so that you are provided with a firm foundation and the necessary coping strategies and tools of recovery. Rehab Guide provide various types of private alcohol treatment including private alcohol rehab, medical inpatient alcohol detox, home detox, alcohol rehabilitation programmes, relapse prevention programmes, individual counselling delivered by BACP registered addiction counsellors, family support and much more. If you are unable to finance private alcohol treatment, we will gladly point you to the correct sources of help local to your area. Alcoholics Anonymous help and support millions of individuals around the world that suffer from an alcohol problem. They offer an infinite network of support that is helpful to those that have already undergone an alcohol detox and counselling/therapy/medication for mental health or trauma. If you or a family member need immediate or urgent alcohol help or rehab in Wales today, please call Rehab Guide for fast, efficient, professional and ethical help. We only work with the best alcohol treatment centres in Wales that specialise in delivering a service that is conducive to achieving long term sobriety. No one need die of alcoholism. As a chronic and progressive brain disease, while alcoholism is not curable, it is completely treatable. Don’t waste another day fighting alcohol addiction on your own; we are here to help and support you and your family in any way that we can. Rehab Guide can make taking the very first step to a sober life comfortable, reassuring and cost-effective. Call and speak to one of our friendly alcohol addiction experts today. Friends Meeting House, 43 Charles St, (city centre off Queen St). Canton Uniting Church, Theobald Rd. Friends Meeting House, Page St.